Cosco is very happy yo have found a forever home. When Cosco, an Australian Kelpie and Stafforshire Bull Terrier from Melbourne, Australia, was told she was adopted she couldn’t believe it. 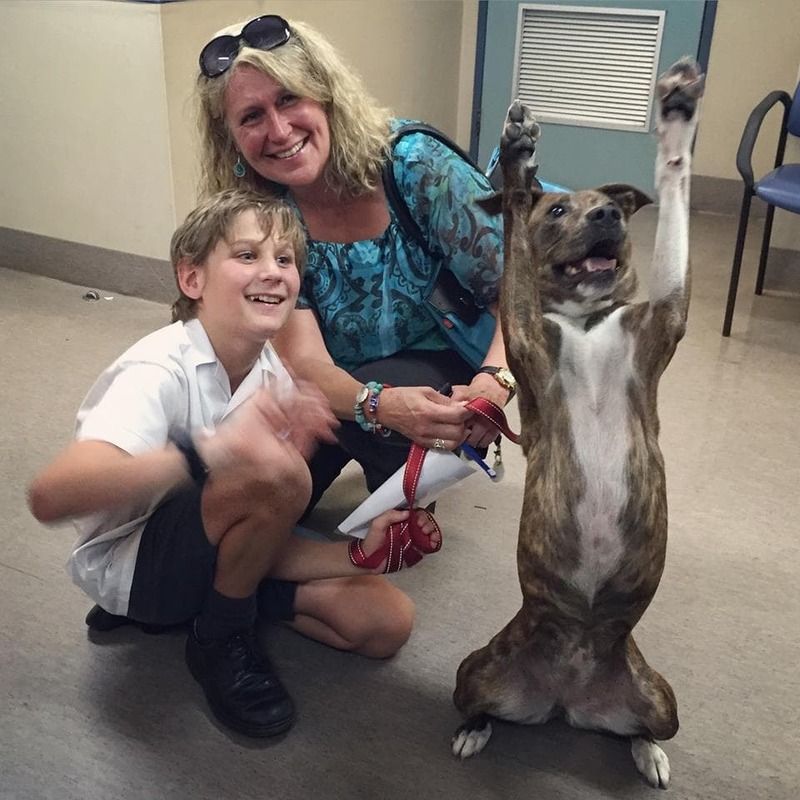 The shelter dog was so excited to have a forever family that she didn’t know what to do with herself. The seven year old dog had been waiting for a home for quite some time, and at her age chances of getting adopted were few. Potential adopters usually want a puppy or young dog to bond with and take home, and even though adopting older dogs does happen, the process is always longer. Cosco with her new family. Photo credit: Lort Smith Hospital. Joe this is why I want to rescue a doggy ? Love love love love!! Be the happy puppy you were meant to be! Congratulations to the “whole” family!!! I couldn’t agree more! Yay!!! She is adorable. Dogs really are smart and have feelings just like we do. Grateful and excited to go ! 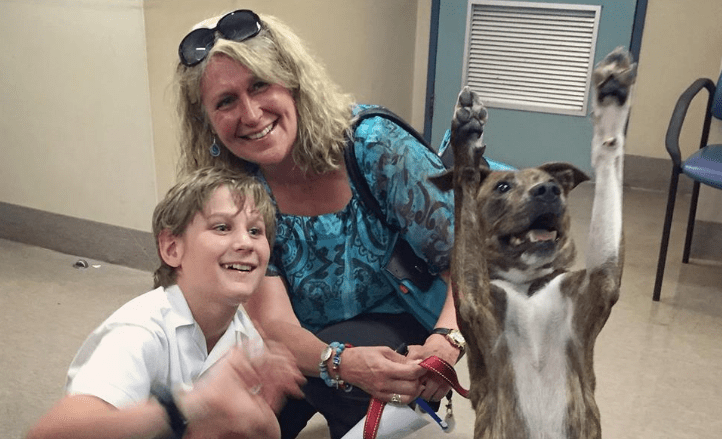 Thanks for view: This seven year old dog had been waiting for a home for quite some time, and finally her dream came true…. ADOPT–NEVER SHOP AND ALWAYS REPORT ABUSE.. Original owners beat this poor guy! Who in their right mind would want to hurt such a beautiful animal. He’ll NEVER be beaten again. In my home he’s pampered and spoiled rotten! Liesa Collier Darla R. Goodwin ?? High fives all round, enjoy life ! Congratulations to the rescued dog! I have a rescue – going on three months now. Her “family” dropped at a Brooklyn Shelter. Hooray Cosco!!! That is really the best photo ever!!! It speaks volumes!! Yayyyyyyy! Good for you sweet baby!! Enjoy your new toys I know you’re gonna get!! That’s a happy Dog! Dogs know. Looks like she’s saying YAY! The dogs name is actually Coso. My baby also comes from Lort Smith where Coso was adopted from. They are a wonderful organisation who adopted out 1000 animals and treated 24,000 animals in their hospital during 2015. They also do their absolute best not to put animals down. They work very hard to rehabilitate animals with behavioural issues to find them loving homes. I’ve seen this pic many times. And it still melts my heart. Such a happy baby! Love this! Oooo lord that dog is forever gonna leap for joy. Such a sweet and fun moment. ❤️? Looks like this little fella is an absolute gem. We had our girl miss rescue, Sheba,lab x kelpie, for 17 years, we where so blessed. I can’t even tell you how much I love this photo! I am happy for her and her new family. Happy tears! Best picture ever, and thank you for giving this sweet one a loving home. how wonderful for all so happy she will have a new happy life bless the family who made their family to and this lucky dog love happy endings. Beautiful picture from a happy dog with his new family !!!! Awww it looks like she’s praising God ?